When autumn rolls around, this the cake I make! It’s homely, and to me, that’s a good thing. I love cakes and sweets that make you feel something, and this cake, well, it’s makes me feel like I’m home. It’s good to give as a housewarming, and you can switch out the fruits to make a more summery version. In a medium bowl, combine the flour, hazelnut meal and baking powder. Set aside. In a large bowl, on the medium speed of an electric mixer, cream the butter and sugars until smooth. Add the egg and egg whites and beat until combined. Add the dry ingredients in three parts, alternating with the sour cream. With each addition, beat until the ingredients are incorporated. Using a rubber spatula, scrape down the batter in the bowl to make sure the ingredients are well blended. Pour the batter into the cake tin. 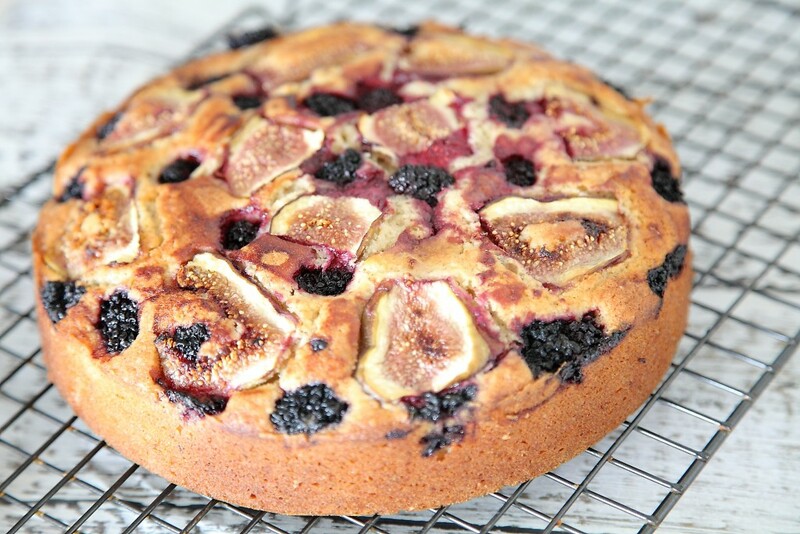 Slice the figs lengthways into slivers and then place evenly over the top of the cake batter. Then add blackberries in the spaces. Bake for 55 mins or until a skewer comes out clean. Cool the cake in the tin for 20 minutes. Remove from the tin and cool completely on a wire rack.